I can identify with the teaching point made below by Jeff Strong. I too hate waiting rooms. Congested traffic drives me crazy. Waiting lounges in an airport make me antsy. I’ve been in that place of waiting on God many time, and I have to admit, I haven’t done well. I want to get on with it and can’t figure out why God doesn’t share my enthusiasm. The application in the article below explains well that waiting on God isn’t wasted time. With God nothing is wasted. As we press into him, he uses those seemingly frustrating circumstances of our life for his greater good. Waiting is not something to be avoided or overcome, but to be embraced. During my adolescent years, I spent countless hours in waiting rooms. I was born with an eye condition that led to ongoing vision problems. By age nine, I was well on the road to losing most of my eyesight, so I was placed on a waiting list for corneal transplants. I had four transplants in six months. To this day, I can describe in precise detail my ophthalmologist’s waiting room: the way it smelled—on one occasion, I asked my grandmother why the room smelled like old people—its eerie silence, and the faded colors on the eye-care pamphlets that I had memorized by my 15th visit. Among these details, one memory stands out: the frustration of having to wait. That waiting room was one in which time inched along for me and my world was drained of all vibrancy and vitality. That was almost 30 years ago, yet those hours spent in stagnant frustration impacted me deeply. Today, there are few things I resent more than waiting rooms. And my hatred of waiting extends beyond waiting rooms. I become frustrated in long lines at the grocery store. I loathe slow traffic. My body even tenses up when I have to wait during the loading time of a video game I just purchased. Waiting feels painfully inefficient, like dead, wasted space. Whether waiting in a car, in line, or online, I compulsively check my phone to see, well, anything—to pass the time. Any update, any tweet, any message that could redeem this fruitless “waiting room” in which I constantly find myself. But as my waiting-averse temperament finds increasing solace in a culture offering strategies and technologies that promise relief from the burden of waiting, I’ve found myself haunted by a question: What if in seeking to avoid these periods of waiting I’m actually inhibiting God’s formative work in my life? As the Book of Acts opens and part two of Luke’s Jesus epic unfolds, the first command given by Jesus to his disciples is: “Do not leave Jerusalem, but wait” (1:4). Why does Jesus command his disciples to wait? Why not just tell them to get a good night’s rest, then ascend into heaven, and send down Holy Spirit so that the mission of God can march forward without any delays? The disciples spent ten days waiting and wondering what would happen next. Wouldn’t it have been so much more efficient to just get on with new creation? In commanding his disciples to wait, Jesus is actually keeping in step with what we see throughout the biblical story: a period of waiting always precedes new creation. Take Abraham, for example. God promised to give him an heir, yet he and Sarah had to wait 25 years before God’s promise was fulfilled. Or take Moses. God called him to be Israel’s deliverer, but made him wait for 40 years in Midian before returning to Egypt. Before God led the nation of Israel into the Promised Land, Israel had to wait for 40 years while an unfaithful generation died off. Before Paul’s life and identity were transformed, he was blinded and made to wait for three days before regaining his vision. And then there is Jesus, very God in human flesh, who waited about three decades before entering into public ministry. Think about your own life. When God closed a door, did he immediately open a window? When a relationship, job, or dream came to an end, did a new opportunity open immediately? Most times we have to wait. Waiting always precedes new creation. It’s the dominant pattern God uses to transform us and lead us from one chapter to another. And it’s the pattern we see in Acts 1. Jesus is alive again, and Pentecost is at hand. “Do not leave … but wait,” says Jesus. I wish I could say I’ve matured substantially in my ability to recognize and embrace this pattern in my own life. But it is as much a struggle now as it was when I was a kid. About two years ago, God made it clear to my wife and me that we were about to face a major transition. A year later, we realized God wanted to transition us out of the church that I had pastored for over a decade. Realizing that one chapter of ministry was coming to an end was tough. Even more difficult was not knowing where God was leading us. Life as we knew it came to an end, and for several months, we lived in the tension of what was and what was next. God had placed me in another waiting room. I wanted closure and resolution, and I wanted God to show me what was next so I could move forward. I wanted to do something—anything—that would free me from the unsettling, frustrating, and anxiety-producing “dead space” of waiting. 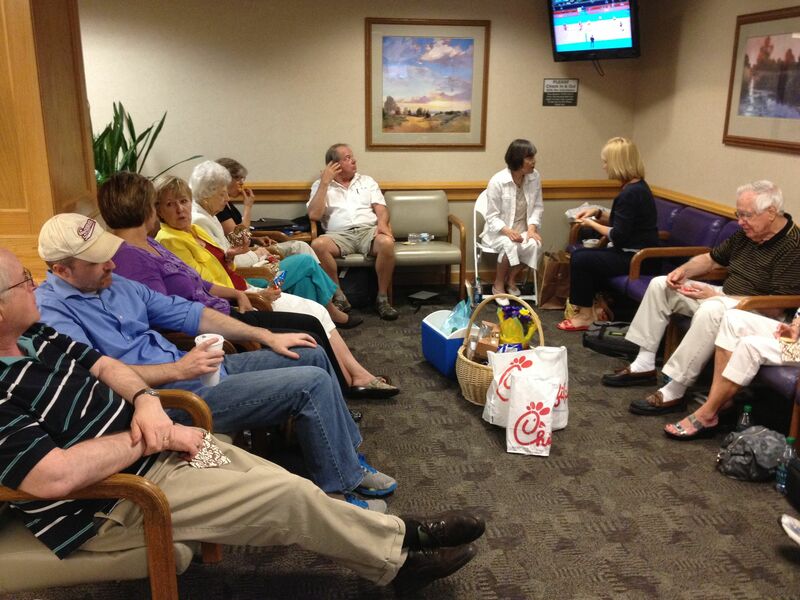 As I contemplated Jesus’ command in Acts 1, I learned why my waiting room was necessary. Jesus asks us to wait because we often need to be reshaped by God’s grace and power before we can move into a new season. God places us in waiting rooms so he can access our undivided attention and strip away the distractions that keep us from allowing him to heal and reform our motivations, ideas, habits, dispositions, and attitudes. In my last period of waiting, God exposed motivations in me that needed purifying, ideas that needed reshaping, and habits that needed changing. Before God could lead me into the next chapter of my pastoral calling, I had to be stripped to the bone—exposed in a way that was deeply uncomfortable but ultimately fruitful. I had no plan to rely on, no self-constructed strategies to give me peace, no timelines to offer me a sense of security. Yet I encountered God powerfully, and I came to know that he alone was enough. As I learned to wait faithfully, God transformed the “dead” space of waiting into something vibrant and intensely alive. New hope and glimmers of glory penetrated my heart and imagination. And when the next chapter of my life was finally opened to me, I was prepared. Waiting for new creation, however, is not a passive activity. The Book of Acts invites us into an expression of waiting that attentively listens for God’s voice and actively seeks him in community. While we may feel alone in the “waiting room,” the text tells us we are never meant to endure periods of waiting in isolation. Verses 3–4 tell us that Jesus drew near to the disciples, teaching them about the kingdom of God, and that this was done over a meal. Feasting on Jesus’ teachings and feasting with other Christians are two ways in which we can wait faithfully. As we live in a period in which the old has gone and the new has yet to appear, we need to steep in Jesus’ teachings. And we are wise to seek the strength and encouragement that is available through friends who can support us in our frustration and anxiety, true fellowship instead of bumper-sticker theology. Sharing food, stories, questions, fears, doubts, and Scripture amidst waiting was vital for me. When we read Acts, it’s easy to skip to the outpouring of the Spirit and celebrate the gift that empowered God’s people and propelled his mission forward in a fresh and startling way. But we cannot forget that Pentecost—like all of God’s new creation movements—was preceded by a time of waiting. Waiting is hard indeed, but it is also a gift—one that begets a greater gift—not just a warm-up to the good stuff. Even as we wait for the supreme gift of the new heavens and the new earth, Jesus has new gifts that he wants to give us here and now, for his glory. Jeff Strong is a Pastor at Nelson Evangelical Covenant Church in Nelson, British Columbia.